Happy Sunday my Beauties and welcome to my new Blog! Sitting here sipping on some freshly made orange juice and some oats, I decided to begin my brand new Blog, with a “Fresh” start. Fresh Fragrances & Cosmetics came out with a Beauty Essentials Box, to celebrate their 10 years in business this September! Firstly I want to congratulate them on their success and secondly I’m so excited to share with you beauties the ins and outs of their Beauty Box! Unlike any other monthly or weekly box, as this was a once in a life time purchase, it came with 6 Full sized beauty products. The Box includes various Beauty essentials like the well known Macadamia Natural Oil , with the No Tangle Brush Set. It’s currently on sale for $99, for a limited time only.Although I will be going through a few of my favourite products included, so let me know if you’ve ever tried these! and as mentioned the Macadamia natural oil, with the No tangled brush set. 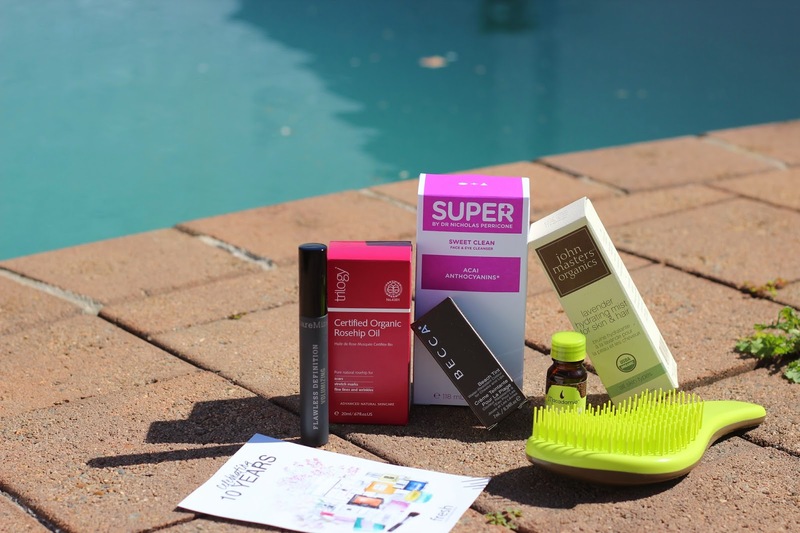 These products are useful all season round, however I must say I did find them PERFECT for Summer essentials, which for us is coming up in Australia! When it comes to my favourites from the box, besides the Macadamia oil, the Rosehip oil is a no brainer for me. I’ve been a loyal user of the product for the past 5 years and find it quite useful and essential for many needs. Rosehip oil can be used for acne, reducing eczema, stretch marks and skin damages. Unlike heavier oils that are commonly used on the face like jojoba and shea butter, rosehip oil absorbs easily. Let me know in the comments below which beauty products are your favourite from the Box! To celebrate these essentials in a box, Fresh Fragrances and cosmetics will be running various promotions on their website. Give them a visit and see what you fancy!